Seth writes; "Ever hear of Mandy Lion? Of course not but I thought I'd ask. Anyways this guy is infamous for walking around LA in 95 degree heat in full leather everything. Mandy claims he can control his sweat glands.." If you hadn't heard of Mandy Lion before, bow to his awesomeness. Then laugh and point behind his back when he goes back to the bar. Mandy, I salute you! P.S. Mandy? But that's a girl's name? ever heard of mandy patinkin? innigo montoya! 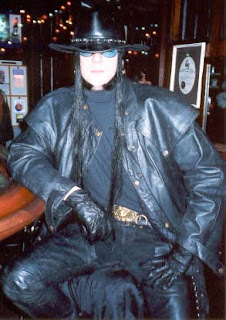 That just somehow blurs the line between gothness and douchbaggery. Look at that face! I swear it's not organic. Are you sure this isn't a piece from Madame Tussauds? Esteban, where is your guitar. to have my Goth card revoked! All hail the awesome Mandy lion! @Kate - true, I fear the sword of Inigo Montoya. Fortunately I don't have 6 fingers on one hand, and am therefore able to take the piss out of boys with girl's names with impunity. Shirley Crabtree anyone? whoa! I thought I was looking at Ian Astbury for a minute there. I went to see the Cult before they were famous. Most memorable moment: Billy Duffy flicked his cigarette over his head, backheeled it with one well worn RockGod boot, and caught it in his mouth to take another drag. Oh Come on! 11 Comments and no one mentions Mandy Patinkin who was Inigo Montoya in the Princess Bride and as Rube on Dead Like Me? How can you call yourselves goth without the coolest of the Mandy's? The dude in the photo doesn't look like a little guy. How is it possible for him to squeeze into leather pants at all, let alone during the summer in LA? Isn't that against several laws of physics? I'd go there just to follow him around in the heat and wait to see what happens when the sweat meets the pants and they lock up on him. GOTH DOWN! GOTH DOWN! Mandy Patinkin's real name is Mandel Bruce Patinkin and I remain a bit unconvinced that a fictional Spanish swordsman qualifies as a Goth in Hot Weather. Inigo's undeniably cool though. As a side note, my login name comes from The Princess Bride. LOL "Marrraige.... the blessed event.... a dreammmm with in a Dreammmmmm"
His... skin... is so pale... it blinds against that much black. He reminds me of Alucard ( Dracula backwards) from anime Hellsing, but in black leather version instead of red. Is there anyone who can see this resemblance besides me? This reminds me of a kid I hung around with in my teenage years (I was never a goth, I was a grebo but in my small town we needed to form alliances to protect ourselves from the Kevs). Anyway, this kid, I'll call him "Muriel" was determined to wear his rubber trousers to the local indie disco, despite it being a hot summers night and him being completely out of talcum powder. Gothy ingeniuty led him to the kitchen and his mother's self raising flour. Rubber trousers + flour + 3 hours sweaty, gothy dancing to the Sisters of Mercy = Glue. I believe it took him many, many hours to remove his trousers that night. Yeah, I know Mandy Lion. Well... sort of... He's one of my myspace "friends." He's "toned down" a little since the 90s. Is that inside a Hooters 'restaurant'?